Have You Tried These Real Estate Magnets For Bringing Value To Business? Finding truel value clients is a big deal for many real estate agenceis and they often invest huge amounts to kick start a marketing campaign and to build up undisputed customer base. Over the years advertisers have been employing various techniques to promote their services. Some of these techniques stood the test of time and are still in vogue, whereas others simply fizzed out of scene causing heavy losses. 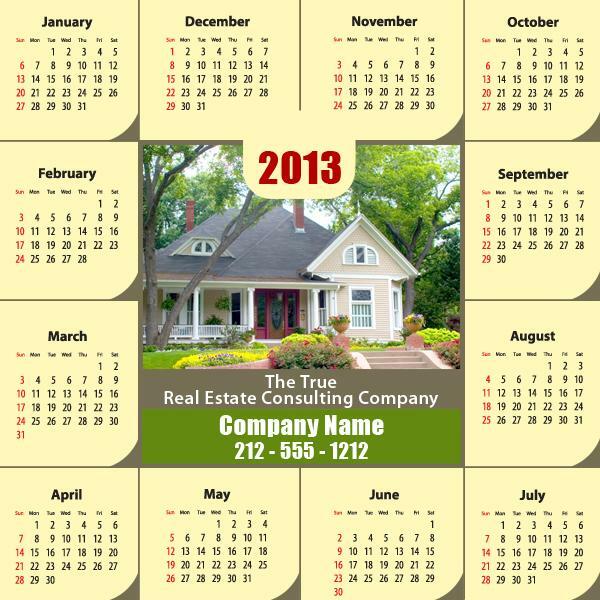 Real Estate Calendar Magnets – These magnets are used by realtors to build their goodwill and introduce their services along with giving date bites! Ooh that sounds cool. A real estate calendar magnet is definitely an uber cool investment choice for real estate advertisers who cannot afford to make larger value investments or re-investments to promote their business. Also, they stand higher chances of retention as refrigerator art, when the year ends up. Real Estate House Shape Magnets – As, the name suggests real estate house shaped magnets are a popular choice for realtors who wish to promote their services in a simple, but elegant way. A house shaped magnet will easily show up against any visible surface say refrigerator door or ferrous metallic surfaces. And is good enough to tickle nostalgic bones within a viewer and they will seriously think about owning a house or buying a new one (if budget permits). Also, this wonderful shape confirms its stay over refrigerator door, unless an equally interesting option pops up! Realtor Business Card Magnets – As the name speaks up, these are typical business card magnets used by real estate advertisers to build their goodwill. Real estate business card magnets are usually imprinted with business information such as contact details, logos, etc. Real estate advertisers who are working in typically lower budget sizes can treat it as a first step towards brand building. Home Calendar Magnets – A home calendar magnet is the one, which strongly emphasizes on the concept of safe housing. Along with giving out date bites and portraying the contact information of a realtor, they trigger the concept of safe housing within an onlooker. This is perhaps one of the magnets in this lot, which packs high persuasion potential and is often retained as a refrigerator art, when the dates on the calendar simply fly away (to become history) and new dates set in. This means a home calendar magnet offers true value for investment for a realtor and he cannot pine for more by one time spending. Land Calendar Magnets – A typical land calendar magnet is sought by realtors who wish to encourage people to invest in lands. Strong business messages coupled with interesting brand messages can do the trick. People who see these messages on regular basis will at least give a thought on investing in land. On close observation you can find that the above mentioned promotional real estate magnets not only aid in brand building, but also influences viewers with their specialized shapes or themes. May be these magnets have derived their character from an old Chinese saying “one stone and two birds”.